The holiday season kicks off Sunday, November 25th, 4:30 to 6:30 p.m. in Essex, CT, with the annual Trees in the Rigging Community Carol Sing and Boat Parade. The Connecticut River Museum, the Essex Board of Trade, and the Essex Historical Society combine to present this annual event that includes a traditional, lantern-lit carol stroll down Main Street where spectators are invited to bring their own lanterns or flashlights and join in with the Sailing Masters of 1812 Fife and Drum Corps and a parade of antique cars. 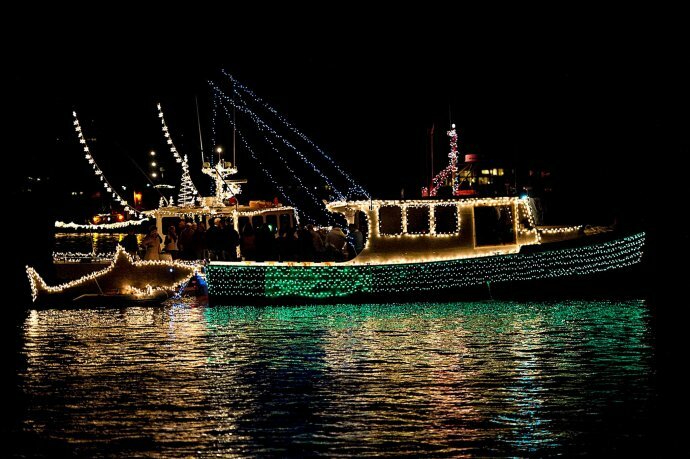 The stroll steps off at 4:30 pm at the Essex Town Hall on West Avenue and ends at the Connecticut River Museum with a parade of vessels dressed out in holiday lights and passing in review along the Connecticut River. The best viewing is from the lawn of the Connecticut River Museum at the foot of Main Street. Santa and his elves will arrive by one of the parade boats for visits with children on the lawn of the Museum. The Connecticut River Museum will also be open that evening for all to attend the 25th Annual Holiday Train Show at a reduced admission of $6. Sponsored by: Connecticut River Museum, Essex Historical Society & Essex Board of Trade.